Whether you host a small wedding, head to the courthouse, are saying “I do” for the second time, or simply march to your own drumbeat, plenty of brides crave something other than the typical princess gown for their wedding day. 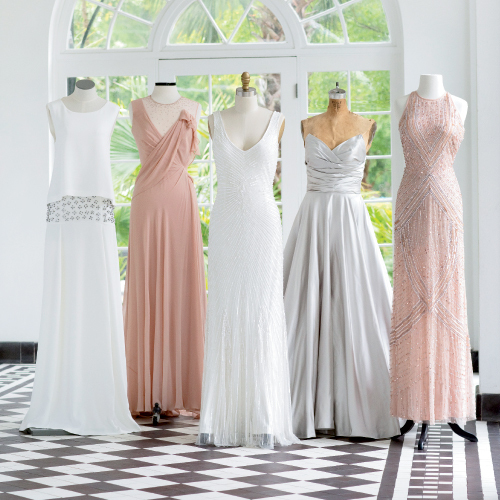 “Ready-to-wear gowns have gained popularity in Charleston,” says Gwynn’s of Mount Pleasant buyer Weezie Fetscher Hiott, “in part because the city is top for destination weddings, and too, because there are more risk-taking brides than ever.” Curious? Read on for some advantages. Get instant gratification. Instead of waiting for months, you can take an off-the-rack frock home on the spot, says Jill Bowman of Swoon. Save dollars. Evening dresses run from hundreds to thousands of dollars, but on the whole, you tend to save when you opt for this genre, says Suzanna Bryant of Rapport. Shave time off your schedule. Alterations should take from one to three weeks, while traditional gowns take months. If the boutique has an in-house alterations team, the turnaround can be even faster. Recycle your gown. Wear these gowns to a charity ball or for New Year’s Eve. Want to recoup the cost? They are easy to consign. Think of your maids. If a bride dons a ready-to-wear gown, says Jill, consider cocktail dresses for attendants for similar styling. Take a look at bridesmaid designers. Some, like Dolly Pearl, work especially well for rehearsal dinners or showers, says Allison Long of Bella Bridesmaids.